But this year I came around to the whole adult notion of being organized (read: my friend made the reso) after seeing a post on Chicha’s instagram feed about a separate vegan/vegetarian set menu with gluten free options. So, everything I want and need in this life for $35? I was in. For readers who aren’t familiar, Dine Out Vancouver is the brainchild of a group of food and wine enthusiasts who got together with Tourism Vancouver back in 2002 and came up with the idea of a fixed price menu to get Vancouverites out of hibernation and into restaurants during the notoriously slow time of year. As more and more restaurants jumped on board and the yearly tradition grew, it became Canada’s largest food and drink festival. Chicha was humming when we arrived for our 8PM reservation. An intimate spot on Broadway just off Main, it specializes in Peruvian share plates and cocktails inspired by Peruvian ingredients and flavours. I started (and ended) the night with a Tia Grima, a spicy and sweet cocktail with habanero infused tequila and pineapple to tease the palate. The first course was a Peruvian guacamole and black bean dip served with cassava root chips. Bury this dish with me, it was so good, and I could have eaten it with my hands once the chips were polished off. 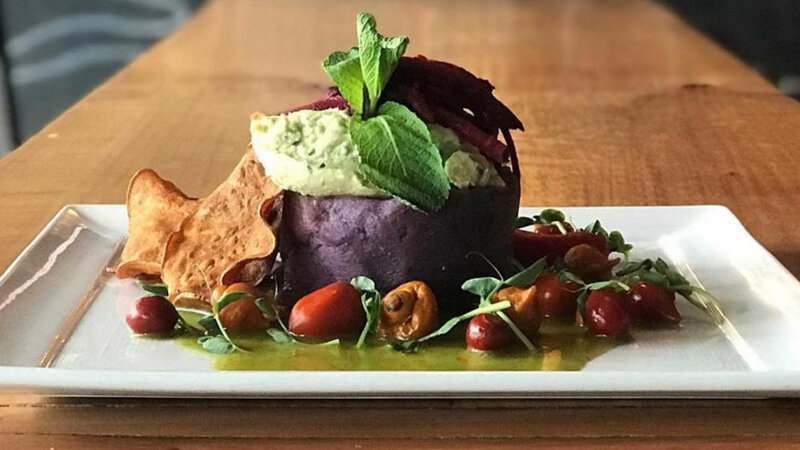 For the two mains I chose the Causa Verduras (beet root whipped potato, lima bean puree, pickled beets, huacatay, and rocoto chili salt dusted yam chips) and the Mushroom Saltado (a stir fry of assorted wild mushrooms, peppers, onions, tomatoes, peas and Kennebec fries). The whipped potato was cold (intentionally) which took my mouth a few minutes to adjust to, but the combination of the herb-y puree, crunchy yam chips and tangy pickled beets made for a very satisfying bite. The mushroom saltado was genius - what happens when you add fries to stir fry? Magic. That’s what happens. I couldn’t finish the large portion, and took it to go and was wholly satisfied wolfing it down cold the next day for lunch. All dishes except the dessert were vegan; dessert was vegetarian. For people like me inching my way over into the plant based world, a menu like this is a perfect example of how when plant-based dishes are made with thoughtful creativity and flavour, you don’t miss the meat. I highly encourage you to make a reservation before Dine Out wraps up February 3rd. See Chicha’s website for their full menu and contact info. You can also find them on Twitter, Instagram & Facebook. See Dine Out Vancouver’s website for all the restaurants participating in Dine Out 2019. Brooke Takhar is a Gastown-based writer, performer, gossip-monger and Mom. She blogs about pop culture, parenting and poop at missteenussr.com, and is a director of The Planter's Guide. She enjoys being early, being right, black coffee, and true crime.